For us as Christians, The resurrection of Jesus Christ has a very deep meaning. It is a greatest gift in the human history. This time I tried to depict the meaning of Jesus’ resurrection from another side. I and my husband focused our attention to the seven words after He was raised. However, need to know that this post is not a Bible study or commentary. This posts just our thought. So later on when read this post you may found any mistake or miss interpretation, please feel free to give us comment, suggestion or critic. This post is based on John 20: 15-29. We are not saying that these are first saying but I prefer called it as seven important words after the resurrection of Jesus Christ. We spent much time to ponder this word. Crying! In life, crying is a life reality. Crying is something which becomes a part of our lives. There is a time when we have to cry for some reason. Jesus’ resurrection is not wiping our tears but He is the answer of every reason for our tears. God has not promised that there is no more rain, but God promised that there is always rainbow after the rain. God has not promised that there is no more tear, but God promises that tears of grief will turn to tears of joy! God has not promised that the sky will always clear, but He promises that in the midst of the dark cloud, God still be there for His children. And one day God promised that: ‘He will wipe every tear from their eyes. There will be no more death’ or mourning or crying or pain, for the old order of things has passed away.”(Revelation 21:4) This time, if we are currently in a difficult situation, have much life’ pressure, our life is so dark, and so many tears, remember that God always be with us. God always be there for us. Here we know something that Jesus recognized the woman as Mary, one of His disciples. This show us that God really know very well every His disciples personally. It means He also knows very well each of our problem. He knows our difficulties and struggling. He appreciates each of us. People will feel much appreciated if his name is always remembered. Jesus did it. Not just to Mary but even to each of His disciples. Further, Jesus care to each of us as His children. In everyday lives, we often just remember to those people who we really care. But Jesus always cares to everyone who believes Him no matter who they are. He teaches us to always put awareness to everyone. Not only to those people who are very close to us. Jesus told to Mary to go to proclaim the news of His resurrection to His brethren. Why the Jesus’ resurrection should to proclaim? Because it news gives a joy. The death of Jesus on the Cross makes the disciples very sad and devastated. And only His resurrections who can make them rejoice again. 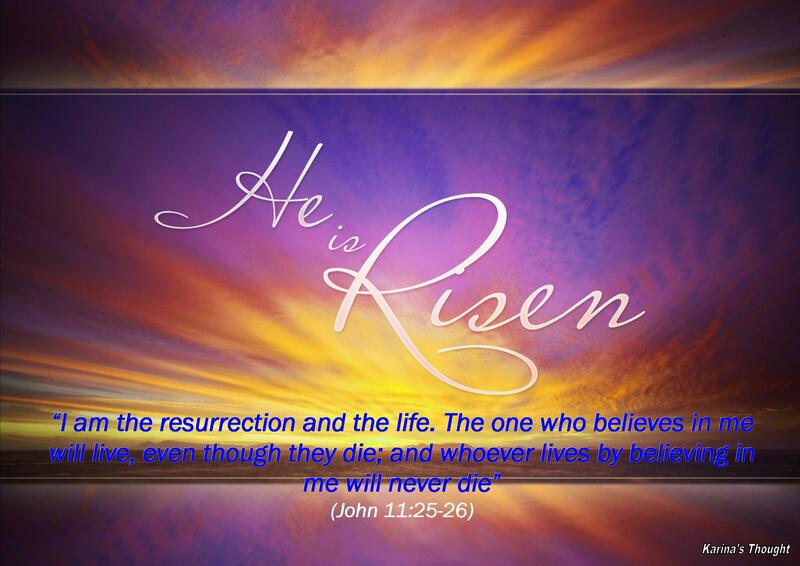 This means that Easter is Joyful news because our Savior has triumphed over power of death. Moreover, the news gives a strength and courage. Jesus’ disciples become weak and fear after Jesus death and they stay in hidden place. The news of Jesus’ resurrection makes them found new courage and strength to keep running life, because they know that Jesus always be with. Hope! Jesus arose with bring a hope. The Death of Jesus made the disciples scattered because they lost hope for the future. Therefore, Jesus’ resurrection reunites his disciples in Jerusalem, and gave them hope for a better future. My dear friends, if we now lose of hope, please remember In God we always have a hope. We don’t need to worry of our future because even though our path is so dark, there is always a light of hope. Fifth: “As the Father has sent me. I am sending you (verse 21b). We thought this point is a most important thing in Christian life. Deputation! Call to serve others. After Jesus arose, He will ascend to the Heaven. It means it is our turn to continue His works in this world. There are three kind of calling that should be done. The first is Evangelism. Call to become a fisher. Church and we are as congregation should to proclaim God’s word bravely to over the world. Bring the lost to know and accept God as a personal savior. We are also the God’s citizen. And even though we are many and different but we are the one body. The third is deacon (Diaconia). As Christians we also called to help the poor or those people in need. This is not just implemented with pray for them but even implemented with our deeds by donate them. We should learn from Macedonian churches who willing to gave much as they were able. If they are in the midst of trial be able to give, why we are that probably in sufficient not to do the same thing. Besides we give an offertory and the tithe, there is no harm to give to people in need such as beggars or the poor. This saying is Jesus’ proving to Thomas who doubt and do not believe in His resurrection. Not only to Thomas but to the many people who doubting the fact that Jesus has risen. Here, we learn not to be skeptic like Thomas. Do not miss an important moment to believe. Even in the worst circumstances, when we do not understand God’s purpose, choose to continue to believe. Nothing is impossible for those who believe in Him. This last saying is talk about something that becomes a foundation in Christian lives. Here we talk about Faith. Relating to Thomas case, Jesus does not rebuke him because he doesn’t believe. Jesus pleased eventually Thomas believes that He arose. It is good our faith grows because we see something miracle happens. But actually, it would be even better if our faith grows by believing something that not seen. My dear friends, in daily lives, how many times we behave like Thomas? We are so hard to believe in something that we do not see. We tend to find out the proof before we believe. One thing to be remembered is we are saved not by works but by faith. And as the righteousness we should living by faith and also not by what we see. In this part, let’s ponder together one thing, how healthy and strong our faith today? How far we are confident and believe in the fulfillment of God’s promises. Through Jesus’ resurrection: We are saved, give us new peace, strength and hope, give us responsibility to proclaim the Gospel, build and maintain fellowship with others, caring to those people who need our hand, and eventually, Jesus’ resurrection teach us to always maintain our faith to trust in God’s will and plan for our life. Dear all beloved friends, the resurrection of Jesus Christ is a greatest gift in the human history. Happy Easter! God bless you abundantly. Amen. Shamgar be able to defeat six hundreds Philistines only by using an ox goad. This was unbelievable! I remembered one Hollywood action movie titled “Rambo” A hero who could strike down hundreds enemies alone. But what I saw in that movie is only fictional. Not a true story. Shamgar’s story is the real one. True story! Actually, who is Shamgar? Unfortunately we could not dig up much about the background of the Shamgar. Shamgar is Anath’s son. 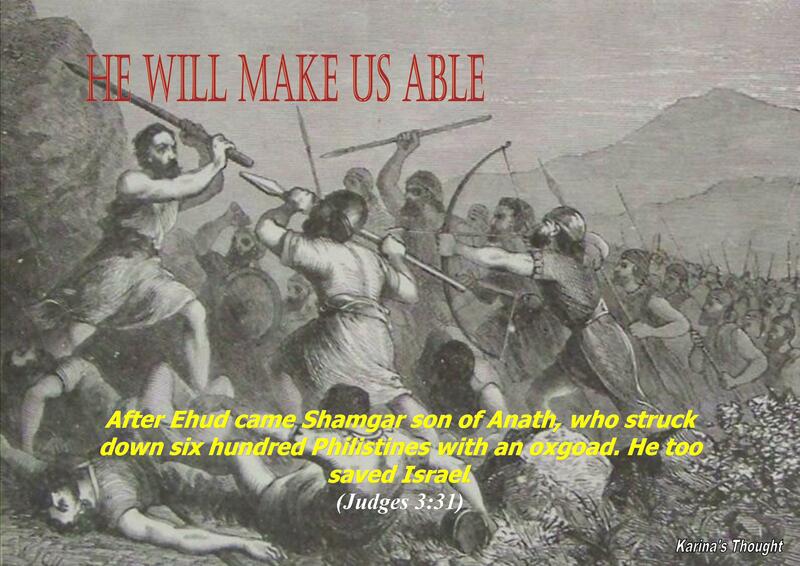 He lived in the era after Ehud successfully defeated the Moabites and make Israel safely along 80 years. But after that Israel should face the Philistines and at that time, Shamgar appeared to resolve the situation, dispel, and killed six hundreds Philistines.The Question is, what does makes Shamgar be able to beat them all just by using an ox goad? When I ponder it, I found the answer. I do believe that it all happened just because God’s help! Shamgar believe that God will be with. He is ready to go beat his enemies and amazingly he won the battle against the Philistines. He has saved the Israelites from destruction. If we dig deeper to the Holly Bible, many times God show us that there is nothing impossible and can be to do miraculous things through those people who chosen by God. Let’s see who is chosen to beat Goliath. A mighty warlord? No! God chose a young David (1Samuel 17:42). Another example, let’s take a look to the story of Gideon (Judges 7). How God commanded Gideon to summon up three hundreds troops only to face the Midianites and Amalekites which described like grasshoppers for multitude and their camel as the sand by the sea side for multitude. (Judges 7:12). There are so many miraculous story in the Bible that could underlie us to be able perform as a winner in overcome various problems and challenges even which seemingly impossible. My lovely readers, we may not a super hero, we may just unknown ordinary person, maybe we are too young among the elderly, and they are look down and dubious to our ability. I would like to say something: Please don’t be discourage or feeling useless. Because God can use and turn us become an extraordinary person and be able doing miracle things. Shamgar is not a famous figure but God use him amazingly to do unbelievable thing. David just a young shepherd but he successfully beat goliath only by using stones and a slingshot. The point is, trust and totally rely on God’s strength. We have to trust that God knows and pleased to His children who love and trust in Him. Through us God will use various miracle things to declare His existence. God can use anyone to show His mightiness and sovereignty. Even God can use the weak and foolish people if He pleases. Besides from many other great Bible figure, this evening I encourage you to also learn from Shamgar’s story. We learn how God’s power works on ordinary people to be able to do miracle things. Through His chosen people God can turn impossible thing to be possible. God can turn illogical thing become logical. We learn to always put our faith on God’s strength rather than on ingenuity and human logic. This time if we are struggling so hard to face so many trials and challenges, don’t worry and don’t feel discouraged. Once again Trust Him! Leaning and relying on God mightiness. Ask Him through prayer so that we are enabled and given the strength. He will make us able. Amen. While stare down, a man walk toward a low table which can spin. In the age of midlife he still looks well-knit and brawny. Year by year that he went through could not be able to scrape a fact that he was a handsome man. The stripe of his face is so firmly with deep niche in eye, tranquil but seems he keep incomprehensible secret. Every wrinkle on his face reveals wisdom of a mature man which full of life experience. Sharply, his eyes look toward stacks wet clay on the spinning table.It is only shapeless wet clay that might meaningless to others. But the man knows very well that in his hands its clay could be anything. Of course it would become something precious. He said, “Can I not do with you, Israel, as this potter does?” declares The Lord.